I made a bunch of hats for my brother’s family for Christmas 2013, every single one of them got a hat…there are five of them. My brother received this hat, a DROPS pattern of course. He loved it, but then his nephew in Germany borrowed it and loved it so much he kept it. Now I take that as a great sign! So towards the end of the year my brother asked if I could make him another hat, now for those who know me, I LOVE getting requests like this, especially when it’s from family! He really liked the hats I had made for his kids, see below, and requested one in his size. So I used the kids pattern and amended it to fit my head/his head. My sister-in-law received this one, which I also knitted for myself and I wear mine all the time in Winter, I posted about it here. She tells me that she loves it too. This one was for my niece Clara, who according to my brother wore it all the time and really, really loved it. The pattern is the same I used for my two nephews. I told my sister-in-law that she could wash the hats, which stretched it and made it way to big for her to wear, so she asked if she could have another one, and she picked the red and white for the next one, which I just knitted recently. This hat was for my nephew, Yoan, who refused to wear any other hat throughout the entire year. When his mum washed this hat, it shrunk to a size that simply didn’t fit my nephew anymore. So, he said he’d really want another one, but it had to be exactly the same. My smallest nephew, Mateo received this one, which fit perfectly. But being under 1 at the time of receiving this his head grew and he needed a new one this Winter. Overall I made nine hats in total for them and they were all very well received, which makes me very happy indeed. Back in November last year, after seeing my brother and his family in October, I was asked to knit another cardigan for my niece. I love it when I get requests like this from my family, especially as I’ve knitted quite a lot for my niece in the last five years. On that note, I can’t believe she’s already five. I used this DROPS pattern, and my brother and his wife decided on the colour combination. I was meant to do the stripes in more random spots, but somehow they ended up like this. I actually like it, it gives it a certain geometry. 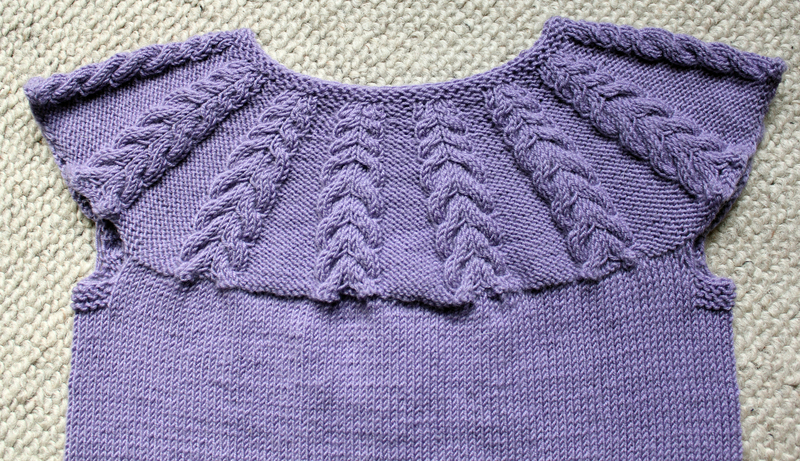 It’s a nice easy pattern that calls for stockinette stitch for most of the body and then goes into garter stitch for the yoke. I’ve done the ribs in the cerise and I think they add a nice little accent. 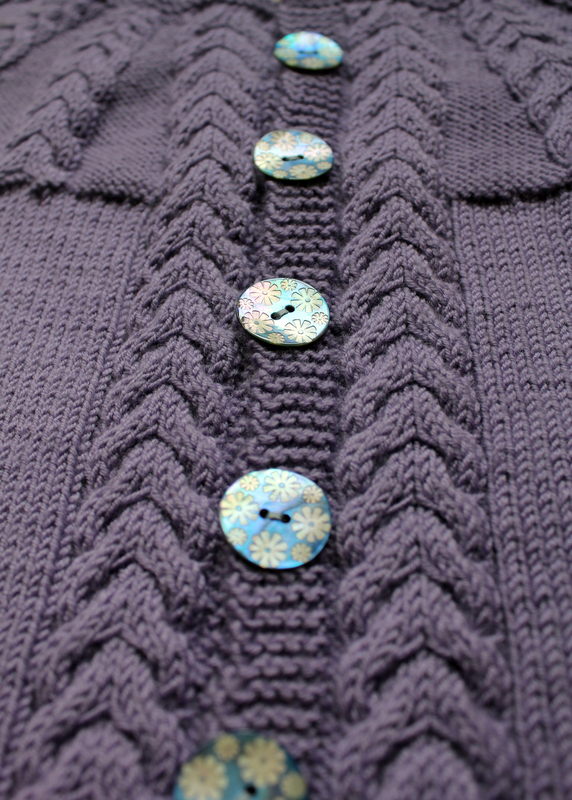 The buttons were ordered from TextileGarden, my favourite online button store. The choice there is just fantastic. I had one set of buttons and then added one of a slightly different colour as the first button…again it just adds a little something. My brother, his wife and my niece were very happy with the cardigan. The sleeves are still a bit long, but I did that on purpose, so that she could grow into it. 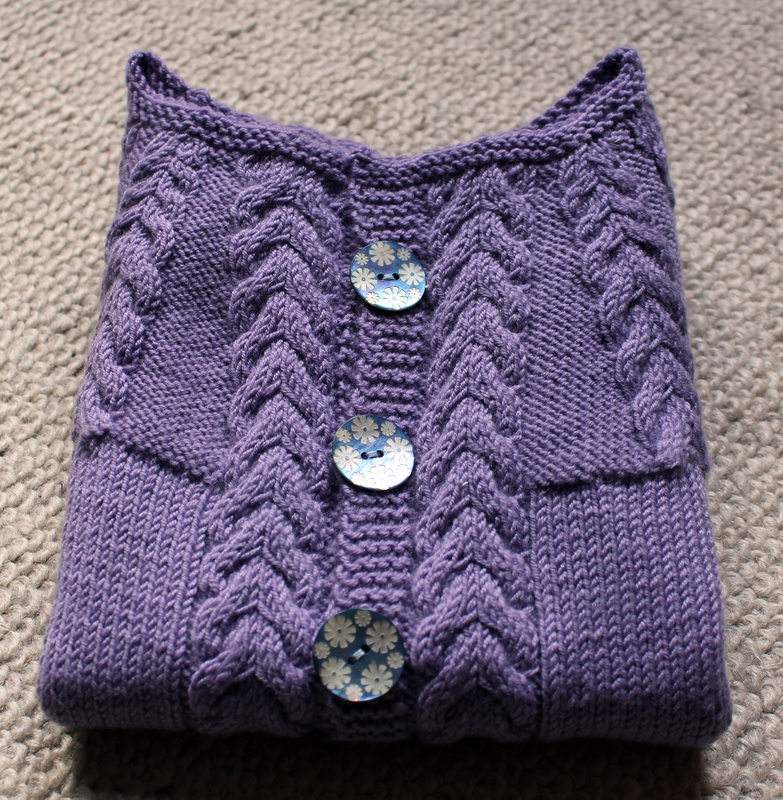 I am cheating and showing you a picture of the cardigan for my niece which is actually already finished. But just a snapshot of it. I am taking a quick break from vest knitting and making a cardigan for my niece. I started this morning…so doing quite well. I don’t feel like I have to say that much about them, only that they definitely took much longer then the socks for the kids. So, in recap, here I posted about my sister-in-laws socks, here are the ones for my nephew and finally here are the ones for my niece. And finally, here they all are in all their glory. And to follow up on yesterday’s theme of trying to tie up loose ends, here are the socks I made for my niece for Christmas last year. And like those for my nephew I posted about yesterday, these are just a straightforward sock pattern that I’ve been knitting in various sizes since I was about 15. My aunt actually taught me how to knit socks initially and I will never forget her patience whilst doing so. I love this colour for socks, and Luke actually has the same pair in a few sizes smaller and he always gets comments on them, especially the colour. Who says pinks are only for girls, right? I will try and tie up this series of socks for my brothers family tomorrow or at the latest on Monday so that I feel free to start the Christmas knitting for them for this year. Apologies for the silence, I’ve been busy, or rather I’ve been away. We went to visit my brother in Germany last week and Luke finally got to meet is cousins Clara and Yoan. It was great! My mum also came for a few days so it was a lovely family get together. 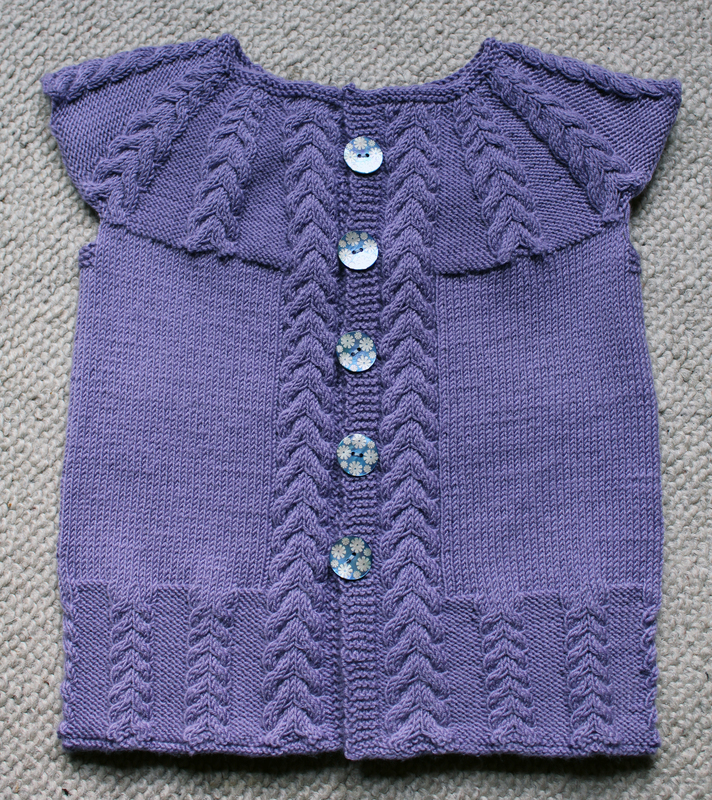 Before we went I managed to finish knitting the cardigan I was making for Clara’s 3rd birthday on 28th April. And here it is. I love this pattern, and I only encountered it by mistake. I was meant to be knitting something else and then found this one. 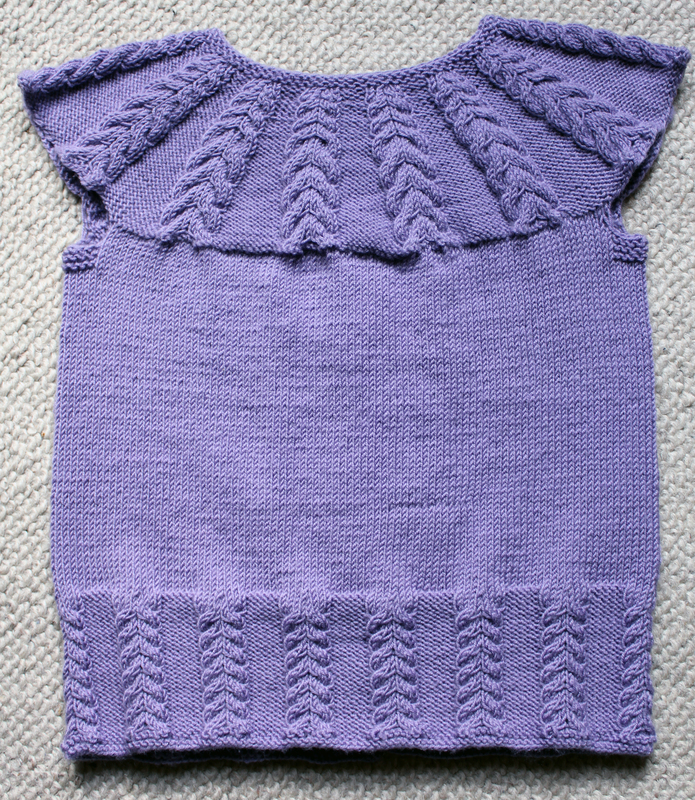 As you’ve guessed it’s another Garnstudio pattern and it was a great one to knit as there were no seams. 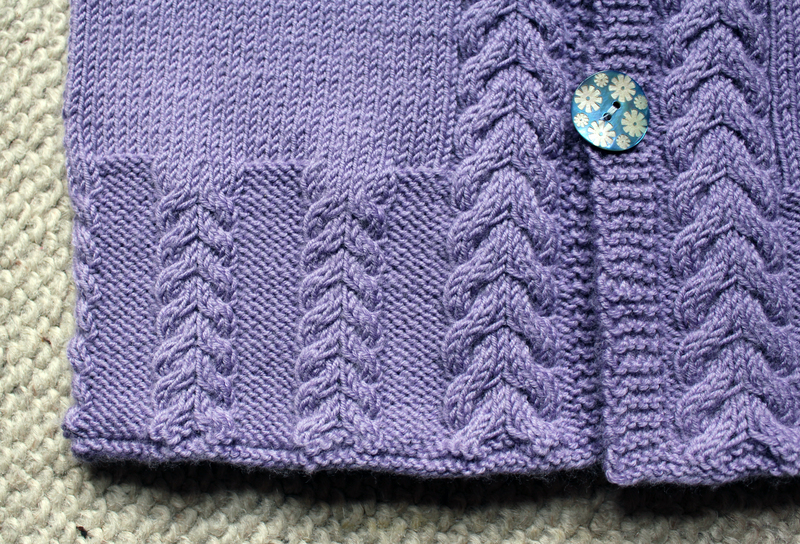 I love the cables on this cardigan, I think they look fantastic and just make the cardigan that extra special. And the buttons are from my last button buying spree. 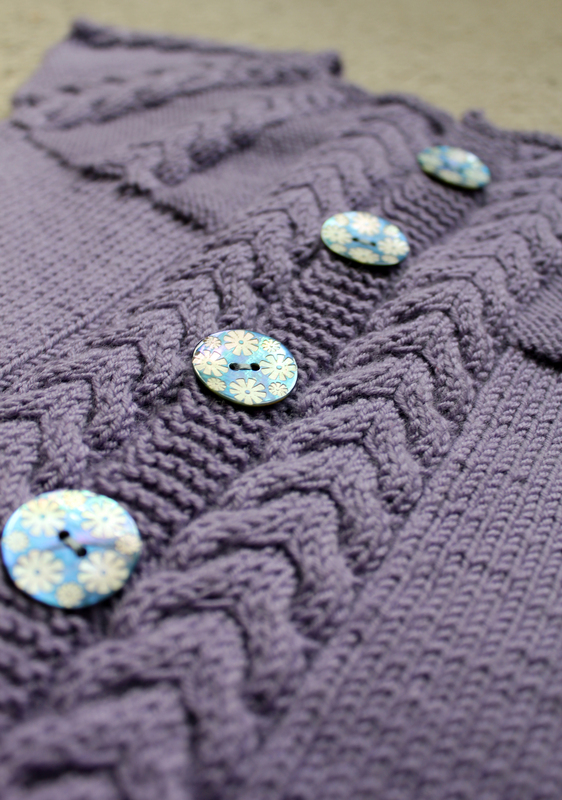 They are mother of pearl buttons with blue colour on it and little flowers, gorgeous, right? The cardigan fits my niece well (unfortunately I haven’t got a photo to show you), so you’ll have to take my word for it. 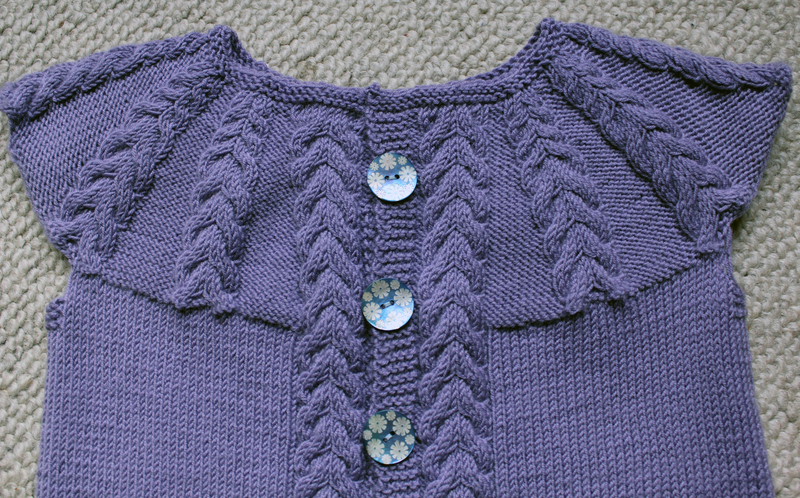 In the meantime here are some more pictures of the cardigan.